Business Model Planner: Here is a tool to help you create an effective business model (the way in which revenue will be produced), covering all the critical bases. As you think critically about your new venture, think not only about the immediate future, but also how you will create a sustainable business. Be hard on yourself. 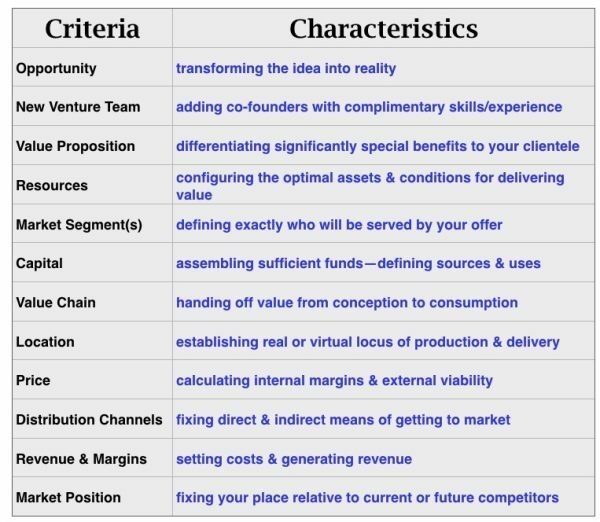 Do not gloss over the characteristics of the criteria I have set in the Business Model Planner table below. Design convincing arguments for each characteristic. When you have done this, it will be abundantly clear where the ‘rubber meets the road’. This tool is designed to help you, but if you want more guidance, then do not hesitate to contact me, and make a point of checking out the Business Model Canvas Tool. One of the toughest steps will be to figure out your value proposition. Start with that! You will also find the Blue Ocean concept a helpful guide to your thinking. You’re going to need to offer your customers more in use value than in cash value. Think about it. Of course, there will be payment, but the transaction needs to be a pleasure, not a pain. If not, your business will fail to delight you or the customer. Its long term health will also be in question. At the same time, realize that your business startup needs to be effective as well as delighting. The process of acquiring your customers must be efficient. If it costs you too much in time or money, you will end up firefighting. You will need to make a good gross margin on sales. Not to profit at the expense of your customers, but to allow for your own mistakes—you won’t win every time. use the Business Model Planner to think about how new customers will become long term ones. Getting new customers is always more costly than serving old ones. Satisfied customers will come back for more and tell their friends. Make sure your actions live up to what is spelled out in the marketing plan. A very useful piece on pricing by Quick Books says, “Value-based pricing sets price levels based on value to the consumer. Effective value-based pricing requires establishing the value of your product or service in the eyes of your customer.” Take a look at the article on pricing strategies for products and services; it’ll help your own thinking. All the above is good advice, BUT remember that there is no ‘one size fits all’ in developing a business plan. Whether it’s done on the back of an envelope or involves all the bells and whistles with spreadsheets galore, the document must have be aimed at a specific audience. You may do a core plan, but it will need focus and adaptation if you are going to use it to support a standard application for a bank loan, to seek venture funding, if the tool you are going to use to bench mark progress once you’re in business, to persuade someone to become you co-founder, or to join the venture in a senior role. These are just examples, you will have your own reasons for writing a business plan; that’s why just taking a template off the Internet can only be a guide, not something to be slavishly followed. When you are ready to put your thinking into words, you’ll find the Business Plan Outline very helpful.